Britain's biggest supermarkets have been defending their practices after a report suggested that up to half of the world's food is thrown away. The British Retail Consortium said supermarkets have "adopted a range of approaches" to combat waste. According to the report - Global Food; Waste Not, Want Not - from the UK-based institution, as much as half of the world's food, amounting to two billion tonnes worth, is wasted. Its study claims that up to 30% of vegetables in the UK were not harvested because of their physical appearance. Dr Tim Fox, head of energy and environment at the Institution of Mechanical Engineers, said: "The amount of food wasted and lost around the world is staggering. This is food that could be used to feed the world's growing population - as well as those in hunger today. Food waste is a subject that people get very incensed about. But this report, while re-iterating the scale of the problem, doesn't really advance the story. The Institution of Mechanical Engineers review draws heavily on work carried out over a number of years for the Food and Agriculture Organisation of UN. However one expert in the field suggested that there was no absolutely reliable global data on the level of waste. One of the boldest claims in the report is that "30% of the UK vegetable crop is never harvested." It suggests that farmers are leaving vegetables in the ground because they don't meet the supermarket standards required. The research on which that claim is based is from 2008 and only looks at potatoes. It concludes that 6% is lost at field level while 22% is either thrown away or diverted to other markets during processing. The headline claim that up to 50% of all food is thrown away really depends on your definitions, one researcher told me. At least a difference should be made between food losses and food waste. Should you smell food before throwing it away? "It is also an unnecessary waste of the land, water and energy resources that were used in the production, processing and distribution of this food. He told the BBC's Today programme: "If you're in the developing world, then the losses are in the early part of the food supply chain, so between the field and the marketplace. "In the mature, developed economies the waste is really down to poor marketing practices and consumer behaviour." Dr Fox called on "governments, development agencies and organisation like the UN" to work to help change people's mindsets on waste and discourage wasteful practices. But the BRC questioned the report's link between promotions and food waste, highlighting a UK government survey that showed buy-one-get-one-free offers were becoming rarer. "Retailers want to help customers make their money go further," it said. "They've also adopted a range of approaches to help people make the best use of the food they buy, including giving clear storage advice and recipe ideas, and offering a wider range of portion sizes." It added that "using more of the crop to cut food waste and increase sustainable production is an objective for all retailers. This is how we are exceeding government targets for food waste." A spokesperson said: "We understand how important it is to tackle the issue of food waste and make an effort to do so in every area of our business - from our manufacturing facilities right through to store. "We don't currently offer buy-one-get-one-free offers on our fruit and vegetables, have relaxed our specifications on this produce to accept more 'wonky' crops and offer clear labelling for customers." Toine Timmermans, from Wageningen University and Research Centre in the Netherlands, described the IME publication as a "relevant report that draws attention to an important issue and topic". But he added: "Based on years of research I find the conclusion about the amount of food waste (1.2-2 billion tonnes) unrealistically high." Tristram Stuart, from food waste campaign group Feeding the 5000, said: "Amazingly, there has been no systematic study of food waste at the farm level either in the UK or elsewhere in Europe or the US. "In my experience, it's normal practice for farmers to assume that 20% to 40% of their fruit and vegetable crops won't get to market, even if they are perfectly fit for human consumption." Tom Tanner, from the Sustainable Restaurants Association, said: "It is the power of major retailers - convenience shopping and supermarkets on everyone's doorstep, you can nip out and buy a ready made meal in two minutes rather than make use of what's in your fridge." 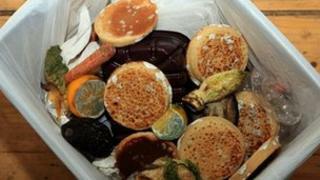 Why is bread Britain's most wasted food?